The autograph manuscript of this collection is arranged alphabetically, with all 264 tune names from EKG-Ausgabe f�r Niedersachsens entered first, then pieces entered for 74 of the tunes. Compositions were entered at, I believe, three different times. The pieces marked below with (*) were entered earliest, probably ca. 1954. 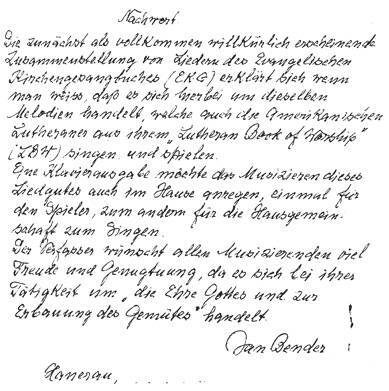 Judging by calligraphic evidence, the �Singen am Klavier� settings were entered last, probably around 1983-84, while the remaining pieces seem to have been written about 1978 (which is probably when this collection was assigned its opus number and the dedication to Matthias and Helga). most have two settings, one w/ c.f. in soprano, other w/ c.f. in lower voice. Written between Feb. 10, 1984 and Feb. 24, 1985. Excerpts from Opus 75b of the 78 tunes which also appear in EKG. (The principal behind this seemingly completely arbitrary collection of chorales from the Evangelisches Kirchengesangbuch becomes clear when one knows that the same melodies treated here are also sung and played by American Lutherans from their Lutheran Book of Worship. It is hoped that a keyboard edition might encourage the playing of the wealth of songs at home, as well—not only for the player, but also for the household to sing. First performance: Aug. 8, 1978 in the Waalse Kerk, Amsterdam, by the Ohio Youth Chorale. Composed: July, 1979 for his sister-in law, Elizabeth (Lies) Peters, a dance instructor. Exercise music w/ instructions for the elderly. Geburtstagsmarsch f�r . . .